Foradian wins Deloitte Technology Fast50 India once again. 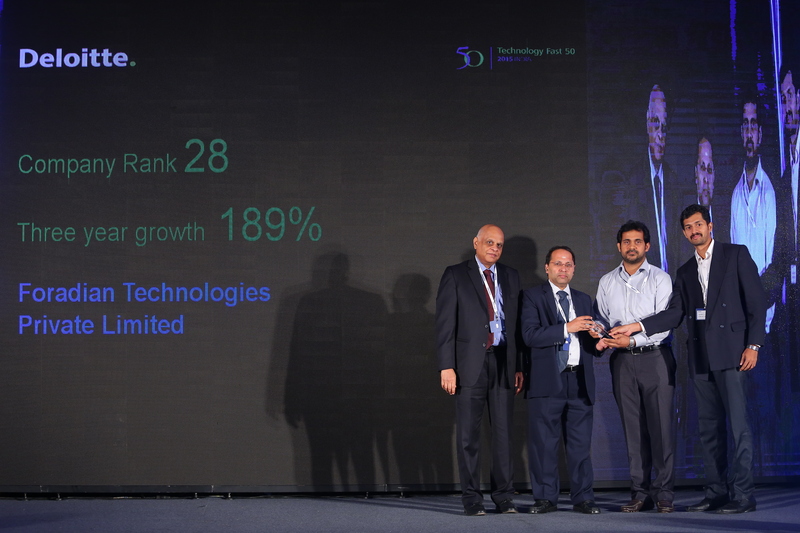 Foradian has been listed in Deloitte Technology Fast50 India once again. Keeping up with our growth story, we have once again achieved a place in the list of top 50 fastest growing technology companies in India. Deloitte recognises, honours, and encourages organizations with remarkable revenue growth rates in last three years. In the 11th edition of this award, Foradian is ranked 28th with a growth rate of 189%. 2 other winners who have ranked 4 times each over the span of the program. While high growth rates are a proof of great efforts and hard work, sustaining this growth with consistence is a sign of greater dedication and a thrive for better results. The winners from the list comprises of 50 public and private companies from areas of media, technology and telecommunications, who have witnessed the highest rates of revenue growth in the last three years. The Technology Fast 50 India was initiated in the year 2005 in line with similar programs in other countries like the Deloitte Technology Fast 500, established in countries like Africa, North America, Asia, Europe and Middle East. The Indian chapter of the award is currently in its 11th year and is considered to be one of the most acclaimed award and recognition by technology companies in the country. Other names in the Deloitte Technology Fast 50 India 2015 Awards include F1 Info Solutions & Services, VMukti Solutions, GreyCampus Edutech, Zomato and Ozonetel Systems.